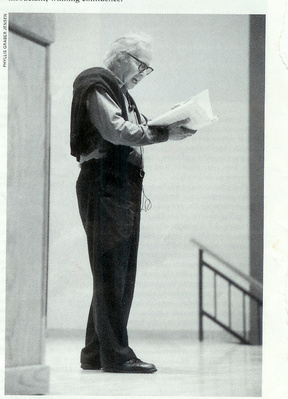 The picture is of John Tagliabue in the full flight of reading, at Bates College Reunion '98. Now, what is poetry? If you say it is simply a matter of words, I will say a good poet gets rid of words. If you say it is simply a matter of meaning, I will say a good poet gets rid of meaning. "But," you ask, "without words and without meaning, where is the poetry?" To this I reply, "Get rid of words and get rid of meaning, and still there is poetry." If there is any absolute, it is never more than this one, you, this instant, in this action. I wonder whether friend and mentor, John Tagliabue, would agree with fellow poet Olson on that notion. I never try to corner a poet about the Absolute. I prefer to follow them about to see what spouts. Our Anglican priest in sermon today shared the Jewish blessing, "May you be covered in the dust of your rabbi!" The point is get close to your teacher, maybe especially around his feet. Writing the poem is not a trouble for me, it is not a problem. When my mind-body-spirit and impulse unite, I write and that's it. It's a compulsion, it makes me feel that it makes "reality" complete, and that's all. But when later I force myself to make judgment-selection and I think what does this poem mean---it's not a natural urgent activity for me. Nevertheless it is persistent for me that after the poem is written I'd like to have it received, responded to; I'd like the poems to be read by many. I'm critical while writing---in that I'm making split second decisions, that's dramatic, part of the sense of crisis and climax---but once it's happened it's Happened. Nature has designed the quality of mercy that falls like the gentle rain from heaven; nature has designed the snowflakes; my character and my life's nature-and-needs have designed the poems; they have come they are here. This is not to say that later I think them all equally "good"; (but I do feel that it's good for me that they all happened, that they have been made; of course I do feel there is the urge-cadence-rhythm; the necessity which will and reasoning alone cannot command, and also my mind---such as it is---with its imagination and needs, making the poem). I feel writing the poems is my work, a most vital part of my life. and sometimes I think of you as a pianoforte. waters of the sea towards them. with this. Holds its own space, and timeless. Lent started in ernest yesterday, and this would be a suitable continuance for it. Yesterday, full moon, a special one in the year they say who advise.